Where did the SWGOH artist come up with the gear pictures from? How legit are the names of the equipment and their manufacturers? And what does it really do in the SW universe? I'm a huge fan of EU (now "Legends") material, and sometimes have a *little* OCD research reaction when trying to dig up the answers. So when I thought to myself: I wonder if 'Loronar' is a real SW Legends name, what ended up happening is that I went on an exhaustive search to find background info on every gear item in SWGOH. A/KT stands for Ayelixe/Krongbing Textiles. This company made textiles and clothing in Legends material, but not weapons. They did make combat and stealth suits though. I cannot find anything approximating the very specific grip shown in the gear picture. This looks vaguely like the Merr-Sonn Q2 Holdout Blaster used in Episode 1, but lacks the correct coloring, grip, emitter, and exact proportions. I'm positive there is a card or game out there that this image is based on, please let me know if you have seen this stun gun! Of course, now that I've posted this everyone will probably jump in saying it's obviously from X game that I've never played... KOTOR 2 maybe? This is used in A New Hope by Luke, Datcha, and other jawas. Han is also described to have one. The prop used by Luke almost perfectly matches the SWGOH artwork: the ridges in the chrome top piece, the silver dial and rectangular bits below line up in the right spots. The angle of the SWGOH art cuts off most of the lower black extension. Arakyd is a droid company associated with making Probedroids for the empire, as well as the smaller probe droids Maul used on Tatooine, so maybe they would actually make this caller. However, there is no official confirmation of Luke's model being directly associated with Arakyd. Athakam Medtech is a medical supply company in Star Wars Legends material. The other medpac pictured is from the online Star Wars: Galaxies trading card game. The general symbol on the medpac looks similar (type of cross with extraneous red dots/lines bisecting the areas between cross beams) but the overall design of the medpac is quite different. On closer inspection, the game medpac seems to have the same Health symbol that appears on Health Mods and HOT buffs (the weird lopsided cross). That symbol comes from the Clone Wars series (see picture of Kix with Medic symbol on arm). Since health restoration and healing is such a huge part in videogaming, I'm convinced this gear is based off some SW game's healing item. I can't find an actual picture of Kix or any other clone Medic using such a medpac, so if you've seen it happen, be sure to post a screen capture. BAW stands for Baktoid Armor Workshop. BAW made most of the Droid Army ground assault craft, like the AAT and MTTs you see in the Naboo invasion. The colors and style seem to be related to the B2 battle droids, but I have not found an exact source of the artwork used in SWGOH. The B2 droids in Galactic Battlegrounds seem to have an especially close color match (pictured). If you have seen something in a game or comic, post a comment. BioTech is a cybernetics company owned by Neuro-Saav. They make devices such as Lobot's halo, which lets him interface directly with Cloud City's mainframe. I'm pretty sure the BioTech Implant pictured here is some sort of cyborg eye (what other implant would be spherical? ... don't answer that!!) and I think the best match for an eye is that of Lauli Wahlo, a character who appears in just a single episode of the Clone Wars show. It's blue, has some ridges in the right places (but not exactly). I think this is an 80% match. The make of Wahlo's eye goes unnamed, but there is a fair chance it was either by BioTech or straight from Neuro-Saav itself. I'll be honest, I don't have the slightest clue as to where the design of this gear comes from. BlasTech probably made billions of mods for their weapons - they supplied all the E-11s to stormtroopers and the Clone blasters as well. BlasTech also made the 'Cybernetic Weapon Enhancement Mod' - a false limb that functioned as a blaster, but it probably cost an arm and a leg. Anyway, if you think you've seen this dumb circle somewhere else in the SW galaxy, post it below to impress everyone with your unparalleled i-spy skills. Used by Han Solo in Empire Strikes Back, this is an EnhanceScan; a general-purpose scanner manufactured by CryonCorp. It's not immediately obvious from the screenshot with its antenna extended, but the shot of the prop is a spot-on match for the game artwork, just mirrored horizontally and given a red glow to that dark rectangle. "and they'll need to collect 50 Cryon Sensor salvages to make 1 Cryon!" "Cryon sounds too much like Crying. Too depressing, we'll lose players. Pick a different fake SW company." "And change collecting 50 to 20?" "Stick to 50. They need to stay mildly depressed." This is a Gilette Sensor Excel ("for Women") spray painted metallic gray in real life. Oops, sorry, I mean this is a SoroSuub Comlink, called the 'Hush-98'. 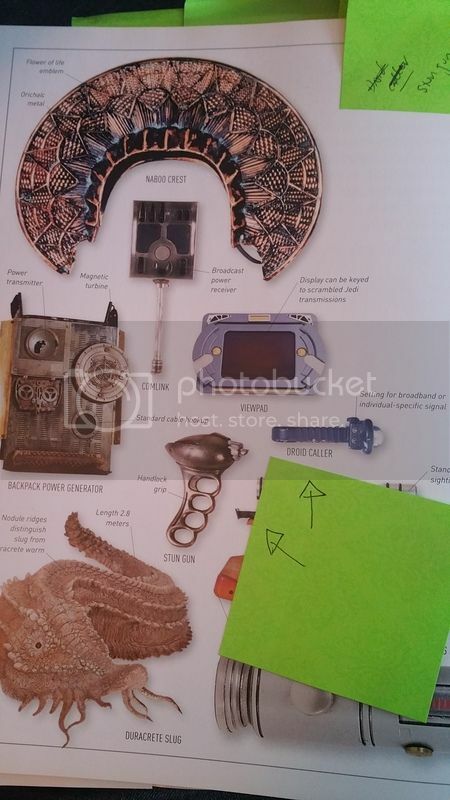 One of these is used by Qui-Gon in Phantom Menace to communicate with Obi-Wan while they are on Tatooine. It's capable of sending data and communication long-range, like blood sample analysis, I guess. A popular bit of trivia about the Hush-98 is that it is a barely-disguised women's razor: you can still clearly see the wavy grip marks on it when QGJ 'clicks' Anakin's blood sample into its base. What you don't know is that Gilette secretly installed walky-talky speakers in all their razors as a reverse prank. Next time you shave, release the blade 3 times quickly and it should connect you with Lliam Neeson if he is within range (/s). Chedak is an actual SW company that specializes in communication technology. The radio on the Millennium Falcon is a Chedak model. It's this kind of detail that continues to bug me. Someone on SW:GOH staff obviously was obsessive enough to know that Chedak was a company that specialized in comlinks and radios, but when it came time to name this gear in-game, they threw out 'SoroSuub' and replaced it willy-nilly. Chiewab is a SW Medical, pharmaceutical and chemical company, mentioned in in recent novel Bloodlines. The story doesn't mention Hypo Syringes, but that doesn't mean Chiewab doesn't supply them. The closest design match I've found to this gear comes from a combination of images. First there's a rendition of a 2-1B medical droid that first appeared in the book Ultimate Star Wars on 9/1/15. It depicts a 2-1B unit with a very similar attachment, dual transparent vials, one shorter and a longer one with a needle tip. The rest of the image doesn't match the SWGOH artwork. The design cues from the 'handle' seem to come from screen shots of 2-1B in Empire Strikes Back as he inspects a dead wampa. His injector here only appears to have 1 needle, but the blocky construction and grip texture mirror the SWGOH artwork. It's also possible there is a completely separate item this is based off of, I would reason either a Rebels or CW animated episode, released sometime after that 2-1B artwork from September 2015. The bright white/red colors and blocky appearance would fit in perfectly to either of those shows. If you can confirm, make a note of it below. ANH has a scene where Luke puts Chewie in handcuffs. The film depicts these as smooth cuffs with a obvious clasp mechanism and bronze sheen, very different from the stun cuffs in SWGOH. In ESBChewie is put in cuffs again, but these are standard Imperial Binders, carried by stormtroopers. Wookiepedia also mentions Stuncuffs made by Merr-Sonn, TaggeCo, and Mandalorians, but not Czerka. Czerka Arms is a background SW company, primarily known as a KOTOR antagonist. Then we have this prop pic is of SC-401 Stun cuffs, made by Locris Syndicated Scurities. This is undoubtably the source of the SWGOH stun cuff artwork, based on position of the quartile dark gray ridges along the edge of each cuff (If you didn't see them before, take a closer look!). Picture is from the New Essential Guide to Weapons and Technology. Again, we see a manufacturer's name change from the original and the original image flip from the source image. Still don't know why, exactly. This chunky-bordered iPad is actually a Versafunction88 datapad, made by MicroData Technologies. There are really clear pictures of it from the Essential Guide and also the online SW: Galaxies Trading card game. I think the SWGOH art is mostly derived from the Galaxies depiction, based on the reduced aspects of the data port on the top of the pad, and the relative thinness when viewed from that angle. 11 years before any iPads existed, Phantom Menace previewed their awesome capabilities on a MicroData datapad (apparently not the 88 version) when Shmi used one to watch Anakin podrace. She literally tells him "I die every time I watch you race," but she's addicted to that screen time, what can you do?? If you've seen that cursed Seagulls video, you know the fusion furnace is (hit in the head with a hackeysack...) Argh! ... (Where'd that come from?) Anyway, you know it's in ESB when Luke is training with Yoda. What you might not immediately notice is there is no manufacturer name before the gear. There is on EVERY other gear, so why not this one? Strangely, there is no manufacturer data in any Star Wars Essential guide either, so I suppose this is accurate. Decipher's card Portable Fusion Generator names this as Lardonis Survival Systems MFCR-200 Power Generator. Although most SW:CCG lore was adopted as official Legends material, this is an 'iffy' one to use because no one ever used the "Lardonis" company name again. Loronar was a weapons company that supplier Imperial and Rebel troops during the Galactic Civil War. They made things ranging from battle stations to blasters. I've looked all over for this and haven't found a good visual match for this item. SW weapons are chock full of cylindrical power cells, but none are brown and none have that tiny thread spool thing on top. Please help if you know what this is. As far as I know, the belt-mounted Merr-Sonn Military Mobility Shield does not appear in any Star Wars film. However, pictures of it as a physical prop for the film exist in the SW: New Essential Guide to Weapons and Technology. The board game Imperial Assault also has a clear image of one being used by a Rodian. Merr-Sonn seems to be the actual (though fictitious) manufacturer. If you know of a scene in the actual films where this prop was used, post it up! I'd love to see where this prop actually ended up. Merr-Sonn's got a great business model: Make grenades to blow stuff up, and shields to prevent you from being blown up. Good business synergy! In a rare showing of EA/CG-naming-gear-correctly, Merr-Sonn gets 2/2 right. This is a Merr-Sonn Class A Thermal Detonator, used by Leia in Return of the Jedi. Apparently, the Class A is a highly illegal military weapon with a thermonuclear blast radius of 20 meters. Kinda gives new meaning to the reactions you see in Jabba's Throne Room when Leia whips it out and triggers the deadman switch on it. Watch Boba Fett legitimately fear for his life before he can regain composure, and watch Jabba laugh it off because he faces death every day from threats like this. These are used at least twice in Empire Strikes Back scenes, by Luke when he's scanning meteor activity, and later by a Hoth Rebel Soldier when spotting AT-ATs. These are officially Neuro-Saav TD2.3 electrobinoculars according to Essential Guide books. The visored viewfinders, little gray periscope on top, and red lights all match the prop promotional photo. Fun fact: these were supposed to be able to provide 500x zoom and holo-record anything you saw with them. The Nubian Design Collective made the J-type Naboo starships (such as Amidala's ship) and the T-14 hyperdrive seen in a brief shot in Episode 1. I'm currently scouring images of The Queen's ship for a place where this circular design comes up, but haven't found it yet. It's possible it's an original creation, or the 'Nubian Design' title is unrelated to its actual location in the SW universe. Let me know if you've seen this Tech. Besides the Thermal Detonator, this is probably the easiest piece of gear to spot in the Star Wars films. In Episode 1, this is called an Imagecaster, and it's made by the SoroSuub Corporation. It gets several prolonged seconds of up-close screentime as Qui-Gon waves it around, so why go through the trouble of renaming it? Moreover, why take the SoroSuub name and move it over to the Keypad, which is specifically not a SoroSuub item? Whoever was in charge of drawing each gear picture undoubtedly had a copy of Essential Guide to ...whatever open in front of them, so what prevented them from scribbling the correct name on the bottom of each drawing? Sienar is a company in SW, most notable for the Empire's ships (TIEs especially). Man, they must be rich a million times over from all the TIEs they've sold. Sienar Technologies was most notable for making ships during the Clone Wars and later the Galactic Empire. Okay, this might be my favorite one because I was 100% sure it was made up artwork specific to this game. Surprise! It's based off of a Gyrda Keypad prop from Episode 1. Prop was made for the movie, but I have no idea which scene it's in, or if it even made it into a shot. 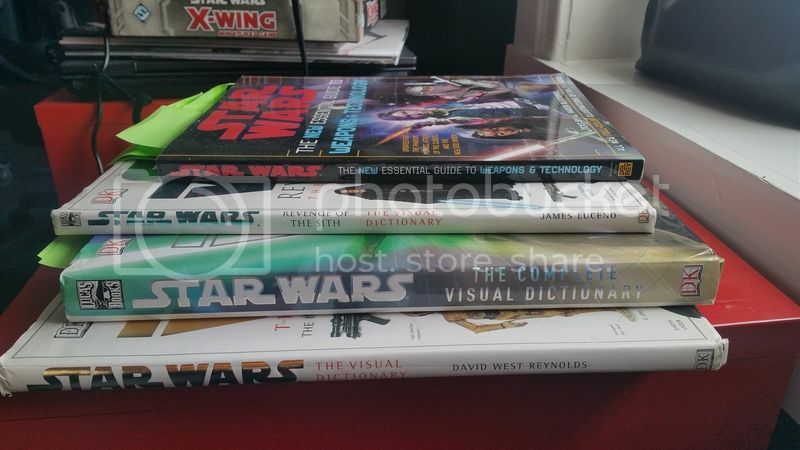 Once again, someone on EA/CG saw the artwork in Star Wars: New Essential Guide to Weapons and Technology and flipped the image horizontally before copying it. The two large buttons on the side compare perfectly, but the diagonal grooves on the side of the keypad are what cinch the match here. Why leave out the Gyrda name when it's clearly named in the book? No idea. SoroSuub is a large conglomerate, make ships, weapons, technology, so maybe it's a knockoff Gyrda product? Or vice versa? I need someone's help to research this one. TaggeCo is megacorporation in Legends material run by the Tagge family. They made everything from industrial equipment to speederbikes to restaurant chains. I can easily see them making a Holo Lense. Whatever that is. Sounds like a SW version of Google Glasses, but more monocle-ish. Closest match I've found is the 'Green Efficiency Scanner' from SW: The Old Republic game. Shape match is close, and coloring/extension characteristics are a long shot from the images in SWTOR. Because the artwork from other gear is more precise (only Imperial Stormtroopers are more precise) I think this may be based off something else. Let me know if you've seen a Holo Lense out there. The Zaltin Company manufactures Bacta, along with their rival Xucphra Corp. There's at least 1 comic series and several game sub-plots that revolve around the fragile economic system of having only 2 companies producing arguably the most valuable healing product in the world, but Lucas was all: 'eh, 2 companies producing the universe's supply of bacta seems about right'. The SWGOH artwork is pretty generic, just a tube o' blue. It's pretty similar to the portable bacta canisters you can pick up in the game Jedi Outcast. There's also a similarity in name and image to the Zaltin field bacta tank, in the game Empire at War. Neither one is a perfect match to the gently flared edges of the SWGOH art, but they are the closest ones I can think of at the moment. If you've got a better match, post below. Yes, I am crazy, but thanks for giving this a read anyway! Again, feel free to fill in any of the blanks or provide your own suggestions in the comments. If you're a Dev, I'd love to know the stories behind the naming/ artwork choices, or any story regarding behind-the-scene stuff, such as: why are most images horizontally mirrored from their original inspirations? Why were these pieces of gear chosen over much more iconic Star Wars devices like Luke's hand, Stormtroopers' armor, Vader's chestplate, Lobot's earmuffs, or Lando's calculator watch? And why are some manufacturer names kept the same with Legends source material, but others not? I'd love to know the actual inspirations for these images for any of them I got wrong or couldn't find. MY LAWD...........this is awesome. If I could donate gear to you, I would. I will call my next furnace "OldDakaNewBarber Furnace"
Holy wow! Gotta say, this is really neat! 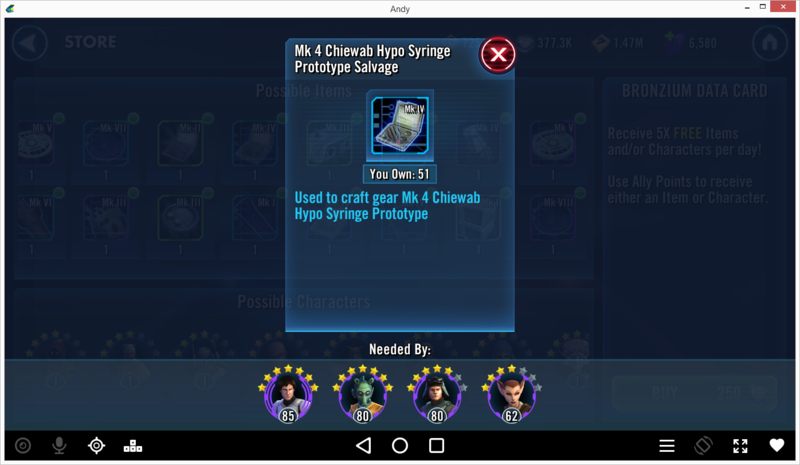 Had no idea the gear items were actually canon items in the Star Wars universe. Props @OldDakaNewBarber on a very cool post. Hi @CG_Kozispoon ! Do you know if the gear images were made by 1 artist or 2 different ones? The shading looks the same across all of them, but several pieces have a strange 'flatness' to them that isn't in the promotional pictures (like the Datapad, chedak comlink, and keypad). Also, do you have any info on the few pieces I can't find? Or why some names were changed and some stayed the same? Thanks in advance for any info!! Gonna rustle up @CG_Naastika to lay down some knowledge your way. Cheers! Hard freakin' core. Just awesome! My name is Brittany, I'm the artist that did about 95% of these gear pieces! I can try to help fill in some of these blanks. I'm gonna make a list, I like lists of things. Also let me know if you have more questions! 1. Artists - The gear was mostly made by me, but we had 2 other artists that helped me finish them off; that's why a couple of them look a little different. 3. Lots of art - I actually made probably triple the amount of gear art that you see in game. Back in early development we had different mechanics for attaining and upgrading gear, so there were many different variations of gear. Mostly just color changes, but there were other differences that were physical. There is also still a ton of art that didn't even make it into the final game! For example, the Nubian Design Tech, that little round white piece you see there, was part of a 35 piece set, and that is JUST for the Nubian Design Tech piece. The circle was one of 6 shapes, and the white was one of 7 colors. I don't remember what the plans were for that particular gear, but it was quite a lot. They wanted something that was a group of easy shapes to tell apart, that I could then make look techy. The Medpac used to have about 7 different variations and upgrades.The one you now see in game is one of our old high-tier medpacks. There were others that were small boxes like that one pictured. So much stuff got scrapped! 4. The bacta gel was the first piece of gear I made! The binoculars were the last piece! 5. Gear naming - Most of the gear naming and references are canon. There are some instances where we needed to make up gear, or modify existing gear/tech to fit in with gear tiering mechanics at the time. I believe these mechanics are long gone. I don't know why some stuff was renamed. It may have been a product of the way we had stuff designed early on. The gear was once heavily influenced by and categorized by Star Wars manufacturers. So you could have a Sienar version of a holo projector, or maybe you would get the SoroSuub version. We scrapped this idea, but I always like when there is more of a story behind stuff like this! 6. Production - Our designers had gone through many of the Star Wars material to find pieces they thought would be cool to represent in game, then I would look at the books, try to find more reference, model them in 3D, and then do some Photoshop magic after. 7. Armor + Weapon Mods - The armor and weapon mods are items that were requested to be generic tech looking "things". I didn't have a description or any reference. It was just something I made up, I just tried to make it look like something you'd plop into some scifi circuitry. lol @ "dumb circle" These were definitely some early pieces of gear. 8. Hypo Syringe - The hypo syringe was made up from the designers, and the reference pictures are spot on, but I had to change it to be a handheld distributor. It's not from anything, I just added a handle. I would sometimes fatten the styles on the gear to reflect the game's style and so you could see what the heck it is at a tiny size. 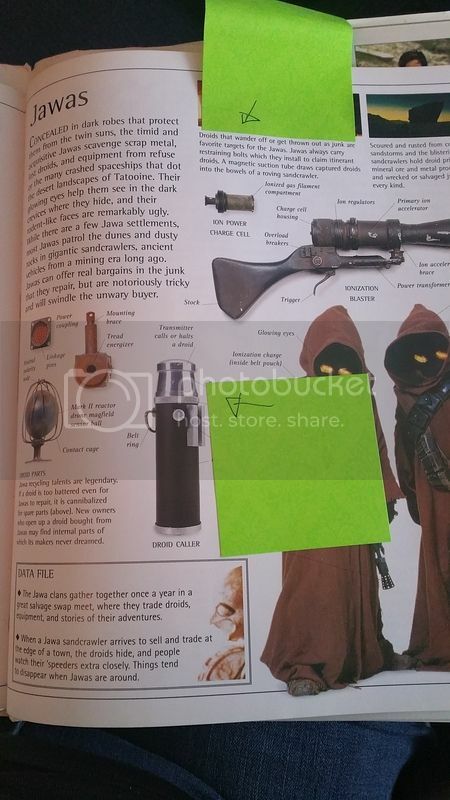 Now that I'm looking at it, I probably got the handle from Sith Medkit that is shown in the Star Wars Complete Visual Dictionary under Episode 2. There used to be another health spray gear that looked more like the one in the picture, but I guess the only thing now is the syringe. 10. Random Gear - We chose these weird gear pieces because Lucas did not want any piece of gear that was specifically light side or dark side or specific to any one character. Since, you are a player in the Star Wars Universe, these are items that would probably be available to any ol' Joe Scoundrel. 11. Bacta Gel - The bacta gel was meant to resemble the big tank Luke was hanging out in, but at that time I was making most of the gear very simplistic. It was supposed to be a small container you could hold in your hand. Any other questions? I did a lot of stuff on this game, I'll try to answer what I can! @CG_Naastika and OP thanks for all the info. This is great. Hey @CG_Naastika , it's great to hear from the artist! First off, thank you so much for all the gear artwork in SW:GOH. I know it boils down to a part of the game where many players stop paying attention to it, but I think it's an awesome tribute to all those lesser-appreciated Star Wars details. That's really cool that you made so much additional artwork for the game! Part of me wishes we had more of that stuff included instead of the salvage/prototype/final build mechanic we ended up with, but I understand the reasoning behind it (less gear type = less to remember what you're collecting). I guess it makes sense. Do you think any unused artwork could come back when Gear level XII becomes a thing, or are we past that point? Thank you for posting up the Stun Gun and Power cell, and letting me know the weapon/armor mods are generic.That would have kept bothering me for a looong time Also, that bit about gear not being light or dark specifically makes so much sense- it's another tiny detail that makes the game better that we never notice. You mentioned modeling in 3D and photoshop for these graphics. The gear graphics look pretty different from the rest of the graphics in gameplay (except for maybe the credits/crystal symbols). Did you work on texturing the character and location models as well? I'm glad I could help patch up those holes for you! I didn't think anyone cared about gear, lol. I'm not sure what the plans are for new gear, it's possible that they could use old art, but there will probably be specific new art needs for new designs. Everything we design has to go through Lucas, and they always make sure that we understand what we are creating and implementing and what it means to fans and what it means to the Star Wars Universe. There is often a ton of back and forth conversations on seemingly small details. Everyone wants Star Wars to be right; I mean, we're all fans of Star Wars! As far as matching other graphics, the early design idea of this game was that it would almost have a smooth, clean, simple, somewhat-comic-book-style. Funny you also mention the credits symbols, as I did most of the HUD icons you see. I did the gold credits, xp, energy bolts, shards, ability materials, friend coins, sim tickets, cantina currency, and countless more that hasn't been used. Oh man, lol. I've jumped around on this project. You're going to start to recognize my art! 1. I've done a number of character and ship ability icons. 4. I concepted most of the environments that are currently in the game. Bravo! Excellent work both of you. Was very enjoyable to read your findings, and insight on production. @CG_Naastika thank you for taking the time to post this. It was a very interesting read!! No problem, thanks for taking the time to read all of that! The Empire purchased supply crates in bulk for large projects like supplying the Death Star. The crates pictured in this event match the one carried by Scanning Crew BT-445, which held various scanners, sensors, recorders and detectors. This is all amazing. Thank you to op and the artist. You, sir, deserve all my carbantis. In seriousness, this is an eye-opener! Thanks OP!